“R. Berthon and M. Audibert  patented a method of obtaining a virtual image by means of an anterior lens and prisms or mirrors. This idea was further improved upon in E.P. 17,023, 1913. In F.P. 458,040 Audibert proposed to use a negative front lens forming a virtual image and three positive lenses in rear to form coplanar images. T. Thorier  stated that this arrangement considerably reduced parallax because the virtual image taken up by the positive lenses has but little depth of field. If f is the focal length of the divergent lens all the field included between a distance d and infinity is compressed into a space practically equal to f 2/ d. And calling F the foci of the posterior lenses, R the ratio of the final image to the aerial image, the distance D of the nearest point which can be satisfactorily taken is found from f / F (2 + R + 1 ⁄ R). The ratio system of the complete system is 1 / n (R + 1), in which 1 / n represents the ratio aperture of the posterior lenses. 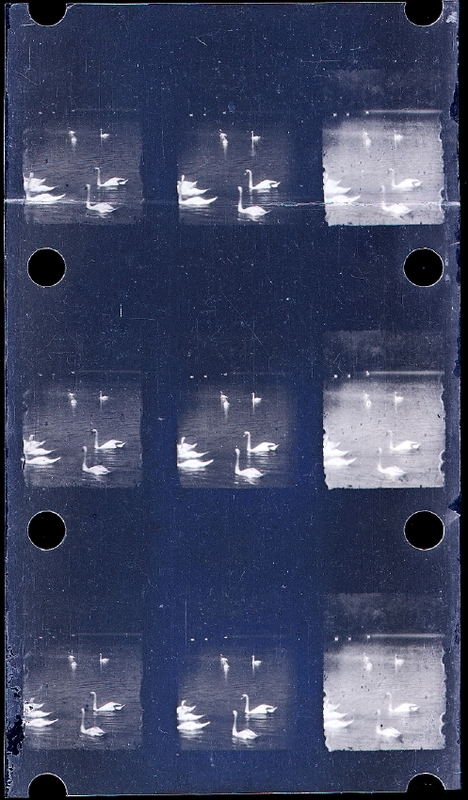 It is easy by making R < 1 to increase the luminosity of the lenses. In E.P. 355,835 this principle was further modified (Fig. 126). C, D, is a divergent objective. 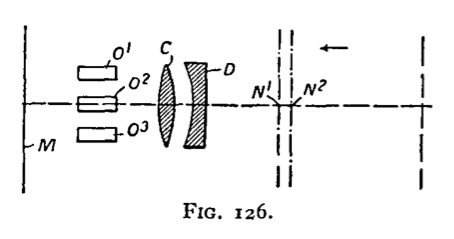 O1, O2, O3, are lenses producing three images on the sensitive surface M. The divergent objective has its nodal points N1, N2, in advance of the lenses, so that the aperture of the objectives O1, O2, O3, can be increased or the total length of the apparatus reduced. The focal lengths of lenses C and D are respectively 250 and — 90 mm., and these lenses are mounted so as to be almost in contact. The Audibert optical system may have certain minor defects from an academic point of view, but these would probably turn out to be less than the errors encountered in three-colour superposition printing. There would probably still be found to be a small amount of parallax, even taking into consideration the shallow depth of field of the virtual image. Other defects, such as coma, might also be present. (4) BERTHON, R., and AUDIBERT, M., E.P. 24,809 (1911).